Ghee is a type of clarified butter that is heated and reduced. It’s an important ingredient to know if you are cooking for someone who is lactose intolerant. It can last for months, unrefrigerated, though you would want to try and use it up within 9 months…which shouldn’t be hard, since you can substitute it for butter or any cooking oil on a 1:1 ratio. And because it’s kept at room temperature, it’s always softened and spreadable, great for last minute baking urges and for having on hand in the pantry. Place the bananas in a large mixing bowl and mash them with a fork. Add the ghee and sugar to the bananas, and beat with a fork or an electric mixer until smooth. Beat in the eggs and vanilla. In a medium bowl, whisk together the flour, baking soda, cinnamon, and salt. 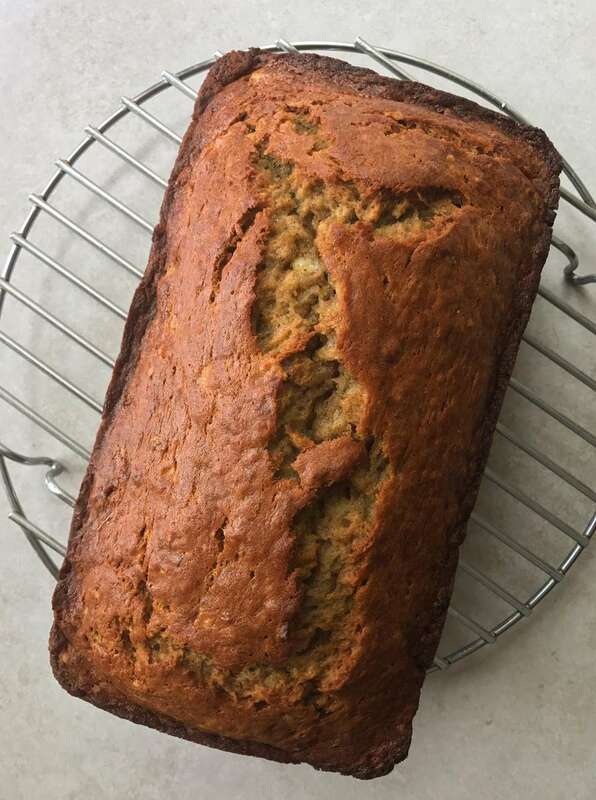 Gradually add the flour mixture to the banana mixture, on low speed with the mixer (or using a rubber spatula or fork) just until well-incorporated, but do not overmix, which will yield a tough banana bread. Scrape the ghee banana bread batter into the prepared loaf pan. Bake for about 50 to 55 minutes until a wooden skewer or a sharp knife inserted in the center comes out clean. Cool in the pan on a wire rack for 10 minutes, then turn out of the pan and finish cooling upright on the wire rack. You can also make these as muffins, and they will make about 14 regular muffins. Reduce the cooking time to about 25 minutes. Cool in the pan for about 10 minutes, then turn them out onto a wire rack to finish cooling. Ghee is commonly used in South Asian and Arabic cuisines, especially India. If you want to make your own ghee, follow this recipe here: "Place 1 pound of butter in a medium saucepan over medium-high heat. Bring the butter to boil. This takes approximately 2 to 3 minutes. Once boiling, reduce the heat to medium. The butter will form a foam which will disappear. Ghee is done when a second foam forms on top of butter, and the butter turns golden. Approximately 7 to 8 minutes. Brown milk solids will be in bottom of pan. Gently pour into a heatproof container through a fine mesh strainer or cheesecloth. Store in an airtight container being sure to keep free from moisture. Ghee does not need refrigeration and will keep in an airtight container for up to 1 month."